Christmas has certainly changed over the years, but the story of what happened over 2000 years ago hasn’t. The world we live in today is increasingly secular. Debates over whether we should tell children about God (or, for that matter, any divine or creative being) are hotly contested. At this time of the year, perhaps it is time to refresh our memories of the events that actually shaped this day. It is important to make a distinction between the Christmas celebrated by Christians of all denominations across the world and those who literally worship the commercialized version of Christmas. A long time ago, a woman by the name of Mary and her husband, Joseph, made their way back to the town of Bethlehem. It was winter and the nights were cold and chilly. Mary was pregnant and her husband led her through the town as she rode on a little donkey. Needless to say, all three were weary but there was no rest to be found at the local motels (or the inn, as they used to say). Finally, when they had nearly given up hope, a stable was offered for lodging and there amidst the warmth of the animals and the smell of hay, a little boy was born. But this was no ordinary child; this was the Son of God. The stars shone extra bright that night as shepherds watched over their flocks. 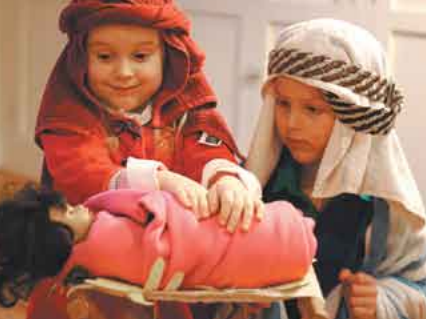 Three wise men made their way to this most humble of homesteads carrying with them gifts of myrrh, frankincense and gold. This isn’t simply the Christmas story; this is the start of scores of Christmas stories that revolve around the birth of a child whose kingdom was not of this Earth. He was named Jesus and was later known as the Christ (which means, Messiah, Messenger and the Chosen One). Christmas Day celebrates the birth of the One who ultimately sacrificed His life for others. Now, irrespective of whether you believe in this powerful story or not, the impact of the message and the importance of giving has remained a constant throughout the ages. Traditionally, exchanging gifts with loved ones was secondary to embracing those who didn’t have anything, whether they were the poor, the lonely or the outcast. The message of Christmas was to share the true spirit and meaning of giving – why would anyone not want their children to understand the history of this story? On a personal note, I do believe that everybody should make a choice to choose what and who they believe in, but surely as parents, it is a duty to inform our children with knowledge of the wonders of the world we live in. And not just Christianity, but all faiths. If you are a believer and a practicing one at that, raising your faith with your children can be a wonderful thing. Ultimately children will make a choice but shouldn’t they be equipped with the tools to decide so that they can make a conscious and informed choice? It is also vital, I believe, to remember that faith, church and religion are often carelessly entwined with little regard for the fact the latter are manmade institutions. Wherever a Christian goes, no matter what denomination, he or she will always be able to find a community ready and waiting to receive them. The friendship and support of communities, whether religious or not, is a necessary part of our modern lives. 25th, family, friends and loved ones gather together. Whether preceded by services or not, there is a communal spirit that brings people together to celebrate. So this Christmas, whether you a practicing believer or not, spare a thought for the message of giving at Christmas time, not just of large pressies and expensive gifts, but also of sharing with families and friends and those less fortunate. You have an uncanny method of expressing your words which I find very interesting.